When using two point linear perspective, one must look carefully at the placement of the object. 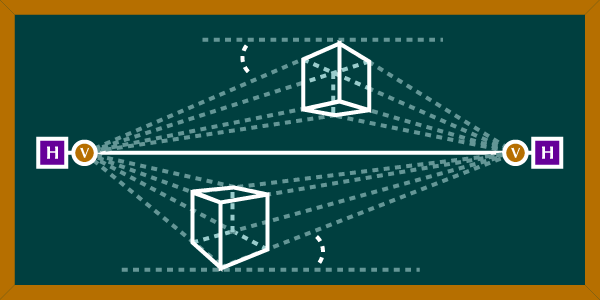 If the object is not perpendicular and parallel to you and you are looking at it's corner, then you probably want to work in two point perspective. Sometimes when working in two point perspective one of the vanishing points is not on the page. You then must approximate where the point falls by looking at the angles of the object which you are drawing. The best way to approximate an angle and find a vanishing point in two point perspective is to first find your horizon line. Then create another level line. By using this level and placing it below the front corner of the object one can then see the angle and continue this angle out until it intersects with the horizon line. After you have found this intersection, then you have established your vanishing point for all the planes that are parallel and recede the same direction. Repeat this process for the other side of your object and all convergence lines will be established. Use the font edge of an object in two point perspective when you want to scale it. This is the only constant line in two point because there are no horizontals on the object to work from. Verticals are always at a 90 degree angle to the horizon line in one and two point perspective. Find your horizon line first. Then find out how much distance in proportion to the object's height there is between the horizon line and the front vertical edge of the object. This will help eliminate distortions. A good example of two-point perspective occurs in the work of Charles Sheeler's On Shaker Theme #2 from 1956. The two planes that make up the architecture rely on two separate vanishing points.